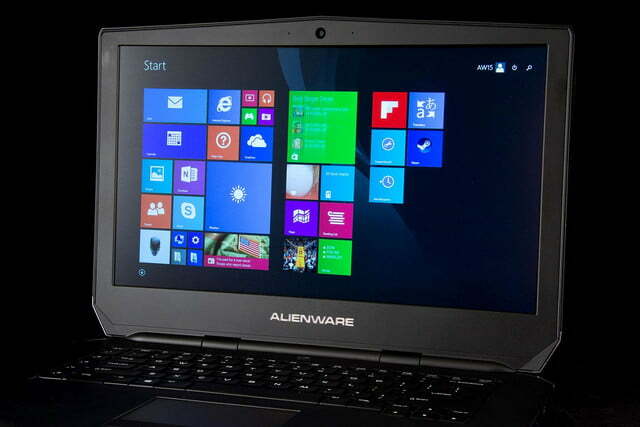 The Alienware 15 is quick for its price, but be sure to opt for a quad-core processor. The Alienware 15 is pure American muscle. It’s a Pontiac GTO from the 60s, with a noisy engine, a hood vent, and an eye-catching paint job. It’s not like a lot of newer gaming laptops – sports cars, with sleek professional paint jobs and tuned, efficient fans. They cut weight to turn tight corners, and pack in carefully selected parts for a sharp experience. Alienware just wants you to roll down the windows, put on some shades, and cruise down the street. Under the hood, a dual-core Intel Core i5-4210H with a base clock of 2.9GHz, and a Turbo Boost of 3.5GHz, powers our review unit. It’s been upgraded to include 16GB of RAM, and for storage packs in a 128GB SSD and a 1TB mechanical drive. GPU grunt comes from an Nvidia GTX 970M with three gigabytes of video memory. Our review unit also includes an Alienware Graphics Amplifier, a separate unit that houses a full-length desktop graphics card, in this case an Nvidia GTX 980. In short, there are some quality components inside. But can a processor with only two cores really make use of all that good stuff, or will nice tires and a great paintjob go to waste on a muscle car that only has a two-cylinder engine? There’s nothing understated about this gaming laptop. Over the years Alienware has earned a reputation for flashy design, producing machines with big fan grills and sharp angles, all lit up like the cockpit of a spaceship with colored LEDs. That reputation is maintained here. 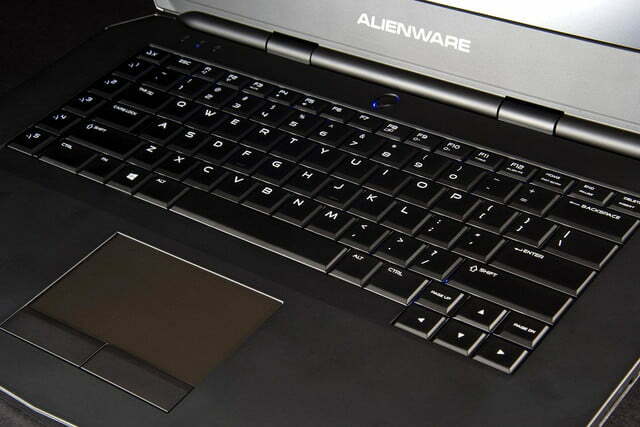 Still, the company pays attention to detail, and as a result the Alienware 15 feels sturdy to hold. The lid opens and closes smoothly, and it doesn’t bend or creak when held. Panels are tight and consistent, although the matte interior finish smudges easily. 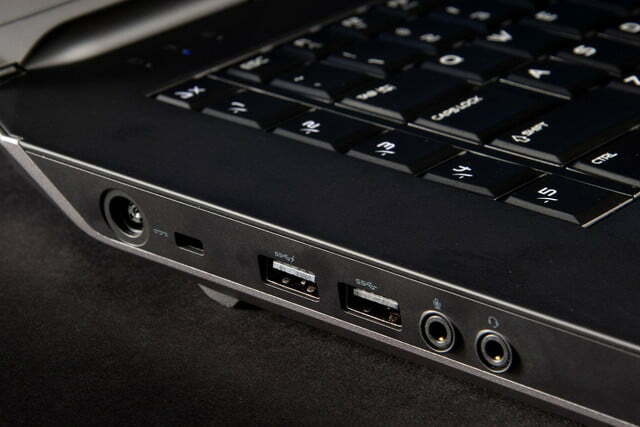 The left side of the system sports a charger plug, two USB 3.0 ports, one of which has PowerShare, and two 3.5mm ports, one for input, one for output. 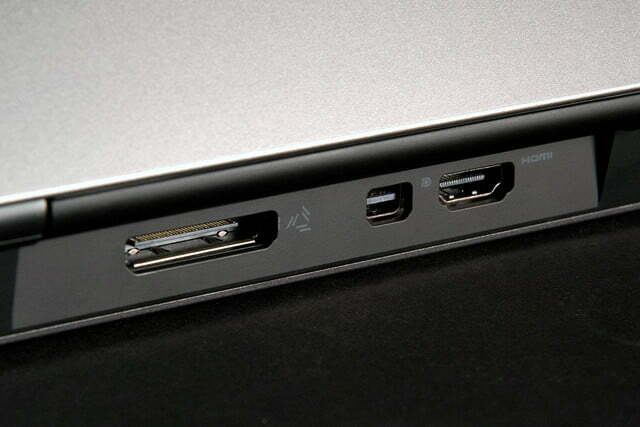 On the right side, an SD slot and Ethernet port flank another pair of USB 3.0 ports. 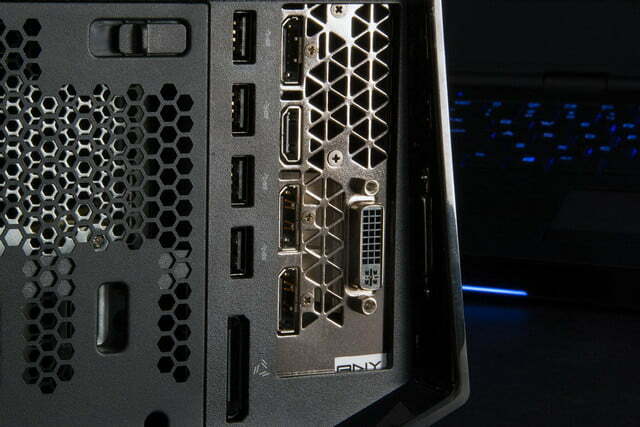 In the center of the machine, on the back, is Alienware’s proprietary graphics port for the Graphics Amplifier, as well as a full-sized HDMI port and a Mini-DisplayPort. For wireless connections the Alienware 15 has the typical pair of 802.11ac Wi-Fi with Bluetooth 4.1. If you’ve ever wondered about the phrase “form over function,” the keyboard and trackpad on the Alienware 15 is a prime example. The entire keyboard is lit by four individually controlled light zones, so you can cascade an animated rainbow over your keys as you game. It’s not too hard to set the patterns through the included software, and some games come with custom settings pre-loaded, like Shadow of Mordor. It’s a good thing the keyboard looks, because the keys themselves need some work. For a keyboard designed with gaming in mind, the keys feel too soft – they don’t have the kind of satisfying, distinct click that’s expected. The laptop has a column of macro keys running up the left side, with a button at the top to cycle through the options. This doesn’t take up much space, but it did make the spacing awkward for the rest of the keyboard. 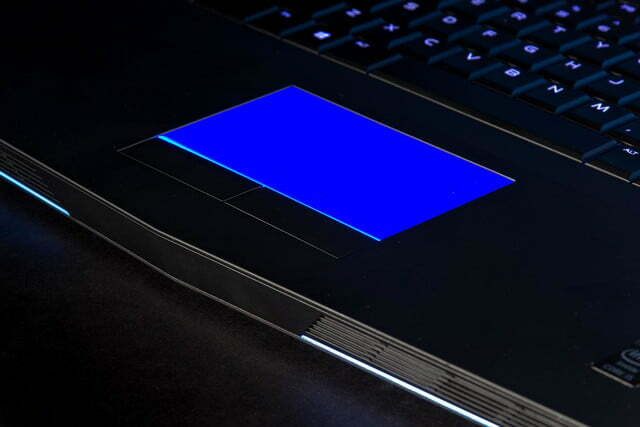 The trackpad feels smooth at first touch, but does offer enough friction to provide modest tactile feedback. While there are two physical mouse buttons, they carry the same non-committal attitude towards clicking as the keys – soft and undefined. It’s not as bad as some of the previous generation Alienware trackpads, but if you’re planning on gaming you’ll want a real mouse anyway. Even at full volume, the audio from the Alienware’s speakers comes through clear, and pack a decent amount of bass, although the high end is a little soft. They aren’t particularly loud at full volume, but can fill a small room with sound. There is one problem; location. They’re on the front of the computer pointing downward, so if you’re using the keyboard while playing a game or listening to music, your wrist noticeably muffles the sound. The screen performs well, providing the deep, inky blacks that let you see an enemy crouched in a corner along with good contrast, especially in games like Shadow of Mordor where colors and lighting change quickly. 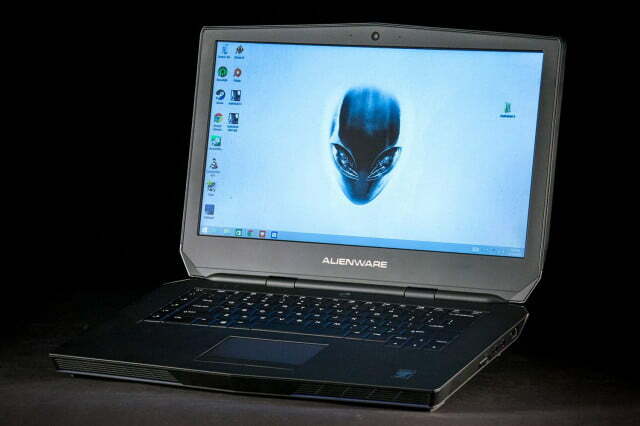 Our test equipment found the Alienware’s screen scores well. It hits 95 percent of the sRGB scale, and 73 percent of the Adobe RGB scale, which is in line with all but the best laptop displays we’ve reviewed recently, beating out the Asus G751 by a slim margin. The contrast ratio is 570:1 at 50 percent brightness, and up to 630:1 at 100 percent brightness, which again is above average, but doesn’t compete with higher-end screens like the Dell Precision M3800. At full brightness, the Alienware managed a mediocre 291 lux, which isn’t quite in line with some of the better laptop displays, coming in well behind the Asus G751’s 334 lux. Our review unit is a special configuration that’s available from Dell for only $1,499, but you’ll have to make a concession on the processor to get there, and it’s an important one. 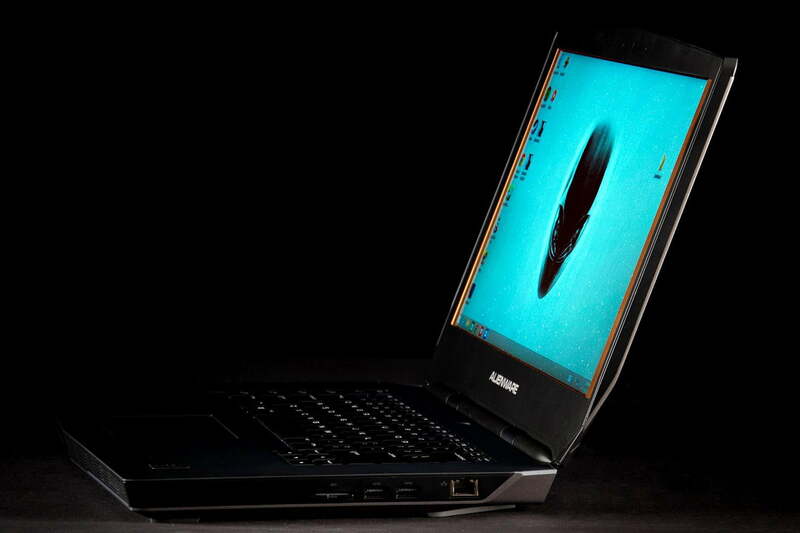 The CPU is was dual-core Intel Core i5-4210H, with a base clock of 2.9GHz, and a Turbo Boost clock of up to 3.5GHz. It had 16GB of RAM, and a GTX 970M with three gigabytes of memory. 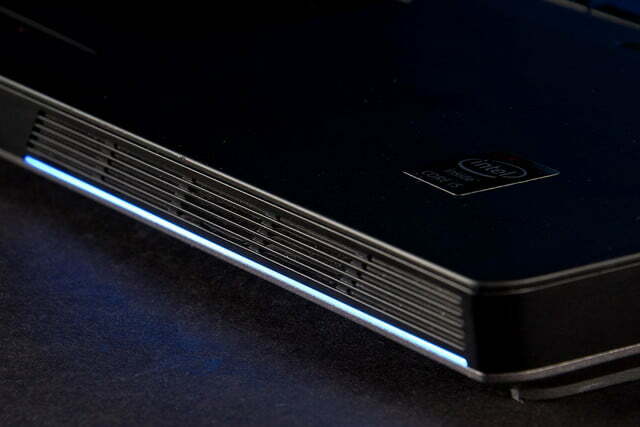 For storage, our Alienware 15 carried a 128GB SSD paired with a 1TB mechanical drive. 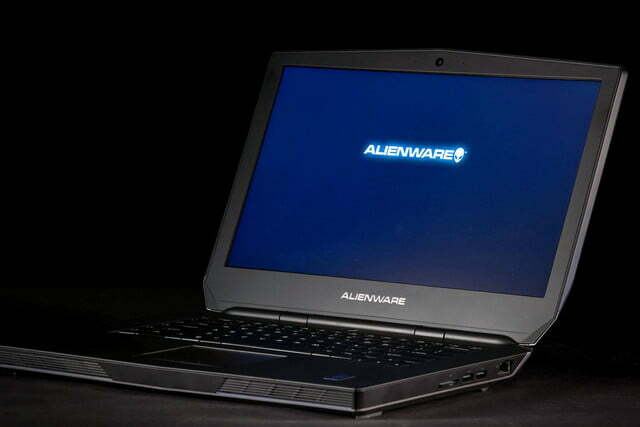 In single core performance, the Alienware was very competitive with other gaming laptops in its category. The flaws of a dual-core processor became more evident when the test kicks all of the cores into gear, however. That won’t always matter because most applications only make use of one or two cores at a time. However, more and more applications are embracing high core counts, so over time the Alienware might fall behind the pack. Our review unit housed a 128GB SSD for the Windows and gaming, and a 1TB mechanical drive for data. The Samsung SSD was an m.2 form factor drive with a read speed of 492 megabytes per second, and a write speed of 135MB/s. The mechanical disk was nothing to write home about, but well equipped to store your movies and music, as well as the majority of your game data, since you can’t fit very much on the SSD. The read speed of the mechanical drive was 143MB/s, and the write was 137MB/s. Futuremark’s 3DMark graphical tests are usually a fairly sharp indicator of gaming capabilities. The Alienware 15 doesn’t hit top marks, but it’s nice to see that in these benchmarks, the dual-core processor didn’t hurt the system too much. Its Fire Strike score was better than the Asus G501J and the Acer Aspire V15 Nitro, gaming laptops with the GTX 960M. Of course, the Alienware 15 is built to play, and the only way to know if it can keep up is to sit down and enjoy some games on it. We tested the following games at 1080p resolution. The CPU is a bottleneck the GTX 980 doesn’t fix, and the 970M is quick enough for most games. The newest game in the Diablo series has been out for a few years, but is still a good judge of basic gaming capabilities. 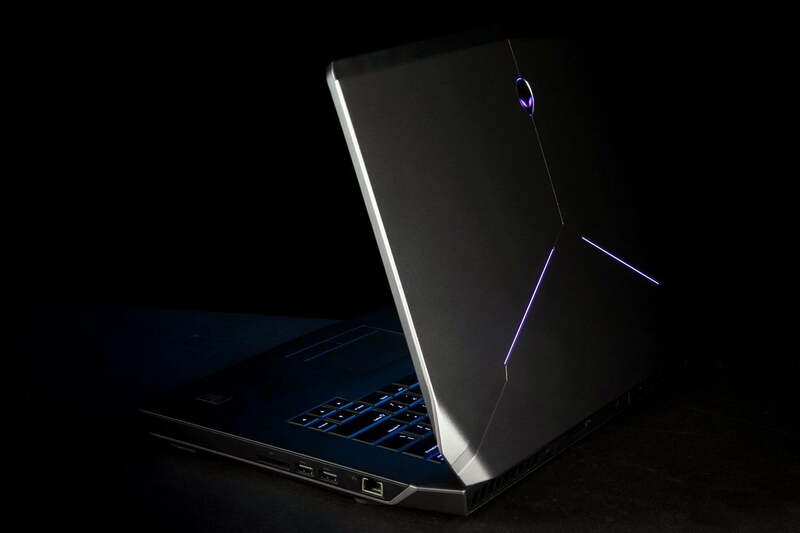 The Alienware tackles the top-down RPG with ease, averaging 170 frames per second with the settings at low, and only taking a small hit down to 138FPS average with graphics turned up to the maximum possible settings. That’s on the upper end of notebooks when it comes to performance, beating out the Asus G501 by a decent margin, but coming in behind powerhouses like the Origin EON-17X. The newest Sid Meier strategy game can really put the hurt on high-end processors, and the review unit’s CPU really showed its true colors when faced with this challenge. At max settings, the average framerate was around 60FPS, which is very playable. At the medium preset, however, the average only came up to about 74 FPS, which seems fine, except that’s about where we found there was a performance cap, even with the Graphics Amplifier plugged in. It just goes to show that when you’re working with a dual-core processor, your graphics card only means so much. EA’s current-gen shooter, Battlefield 4, has an impressively high cap for graphical demands, and while it applies fire to the Alienware, the systems keeps a handle on the situation, with an average framerate of 87 FPS on medium detail settings. Bumped up to ultra, the Alienware still held an average framerate to about 54 FPS, even with trucks exploding and bullets flying. This Tolkien-based RPG is one of our favorite games from 2014, and doesn’t hold back when it comes to sharp graphics and effects. The Alienware fought valiantly against the hordes of orcs and managed an impressive average of 74 FPS with settings on the medium preset. When we turned everything up to ultra and installed the HD texture pack, the Alienware didn’t falter, holding the average frame rate to a playable 50 FPS. We recently added this game to our benchmark lineup, and it’s also an extremely apt test of a modern system’s ability to handle both intense graphical demands and processing challenges at the same time. Even under the most stressful graphical conditions, the Alienware 15 averaged about 54 FPS, and turning it down to medium brought the average framerate up to 70 FPS. 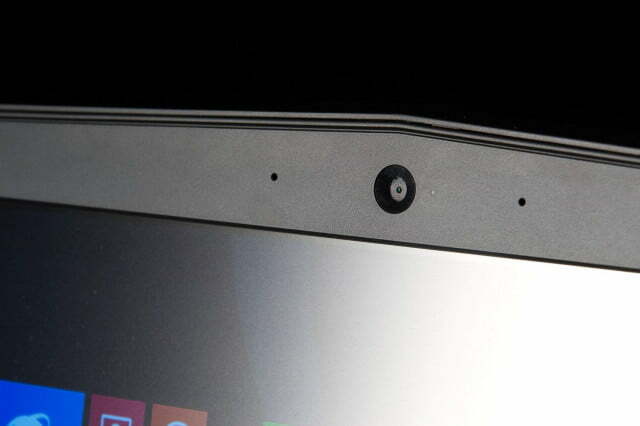 The graphics power of every laptop is constrained by its portability. 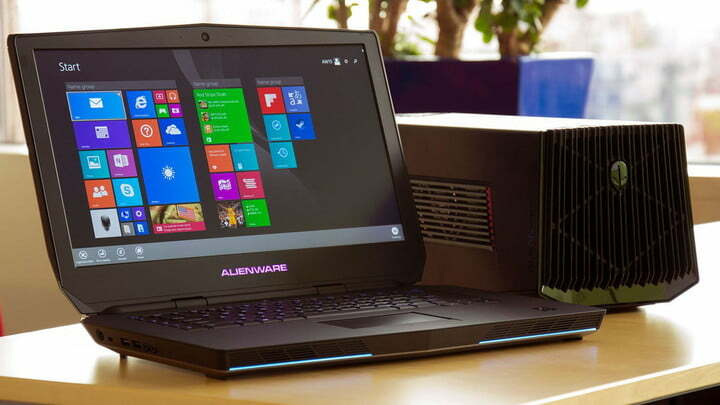 The Alienware 15 can travel, but that means it offers less space for the GPU and the cooling it requires. Performance suffers a result, and the compromise between power and portability can be frustrating if you mostly use your laptop at home, but do travel on occasion. Dell has a solution for this problem. 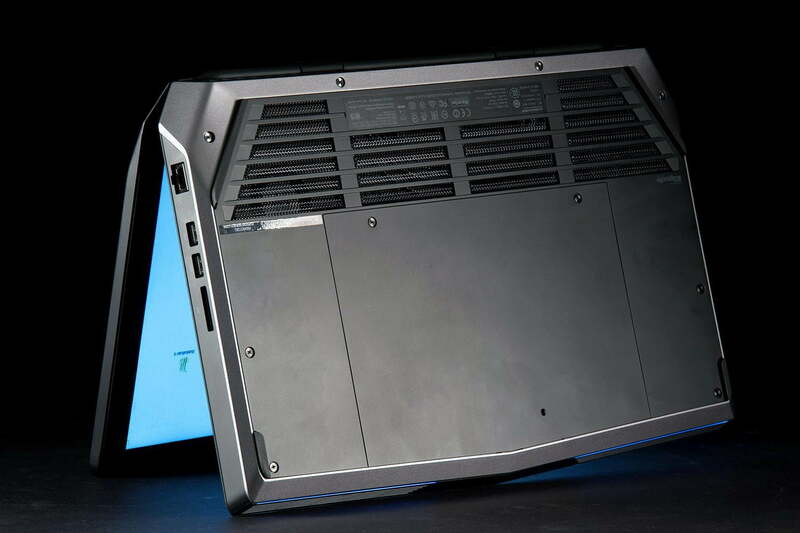 The Alienware Gaming Amplifier offers a power supply and socket for a full-sized desktop graphics card. You plug the Amplifier into its own power source, and then attach it to the Alienware 15 through a proprietary cable that Dell says is a combination of PCIe and USB. If you decide that’s a feature you want, the Graphics Amplifier on its own costs $199 from Alienware with the purchase of a laptop. It doesn’t come with a graphics card, though; you’ll still have to buy one. 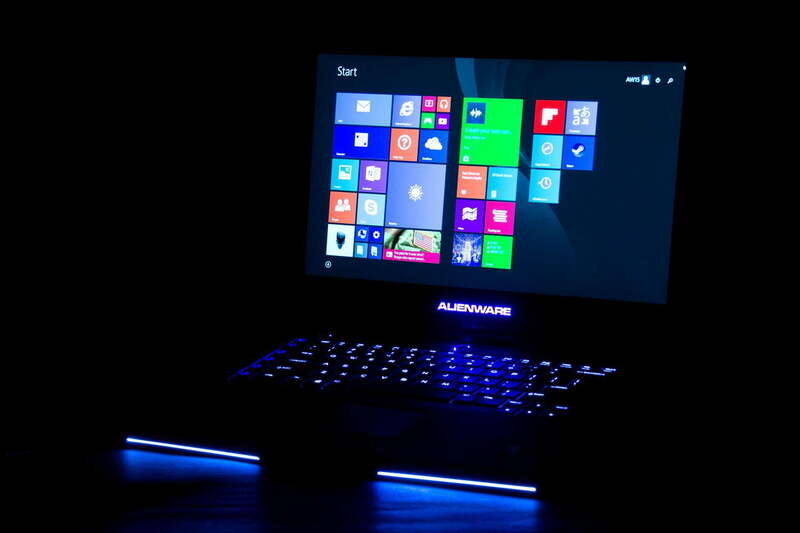 For testing purposes, we used an Nvidia GTX 980 provided by Alienware. Let’s see the difference a desktop card makes in games. We ran the benchmarks again at 1080p, and also added 4K. The Alienware Graphics Amplifier certainly pushed Diablo 3 into high gear, offering up a 204 FPS average with the settings at maximum. That’s a big leap over the 138 FPS the game managed with the internal GTX 980M. With the Alienware 15 and the Graphics Amplifier hooked up to a 4K monitor, the system was still able to hold its own. With maximum settings turned on, even ultimate abilities and wretched monsters don’t phase the machine, dropping the FPS to a still smooth average of 89FPS. This turn-based strategy game isn’t the top when it comes to graphically demanding games, but it can really tax a system’s CPU. This is particularly clear when it comes to the Alienware 15, and it’s also a great example of a bottleneck. Regardless of video settings, the framerate during the benchmark averaged out to about 75 FPS. The dual core processor keeps the performance capped about there, and no matter how much GPU power you throw at the game, that’s not going to change. The Alienware is able to manage 4K gameplay for Beyond Earth, and it doesn’t even take much of a hit from 1080p, coming in at 66FPS average under medium settings. Clock the settings up to ultra, and the framerate comes down a little more, settling at about 46FPS average. That’s still very playable. This is one of the few games that actually experiences a performance boost from hooking up the GTX 980 to the laptop. At 1080p resolution and medium settings, there’s about a 33 percent bump in average framerate, from 74 FPS without the Amplifier, to 99 FPS with it plugged in. With Ultra settings turned on, the average framerate comes down to 76, about equal to medium settings with the built-in graphics adapter, and a 50 percent increase from the ultra settings with the 970M. Shadow of Mordor is still a challenge for the Alienware at 4K resolution, even with the help of the GTX 980. Under medium settings, the average framerate is 51 FPS – still playable, but you might notice the slowness when things get hairy. When the settings are turned up to ultra, the max framerate doesn’t even hit 50, and the average hovers around 35 FPS. That’s tolerable, but it’s not ideal. It’s good the keyboard looks cool, because the keys themselves need some work. The good news is that with the Gaming Amplifier spicing things up, the Alienware rocked an impressive 69 FPS average under medium settings at 1080p resolution. The bad news is that’s the same result we saw running GTA V without the graphics amplifier on. Ultra settings were the same as well, with the Alienware averaging about 54 FPS on both the standard setup, and with the Alienware Graphics Amplifier. Surprisingly, the Alienware is more than capable of playing Rockstar’s newest title in 4K resolution, and even manages to keep the average framerate around 60FPS with the settings turned to medium. It doesn’t fare as well with the settings at ultra – the framerate drops down to about 40 FPS, though that’s still playable. As a proposed solution to the issue of lackluster mobile graphics, there’s nothing wrong in particular with the concept of a Gaming Amplifier. The issue comes in how well it actually works, and unfortunately, the answer is not very well. If you have to game in 4K for whatever reason, and you have to have a laptop, it might be your only option, but it’s not one that enthusiasts and gamers will be very satisfied by. With our review system especially, the processor proves to be a bottleneck that a GTX 980 doesn’t really fix, and the 970M is fast enough to handle games at 1080p resolution. 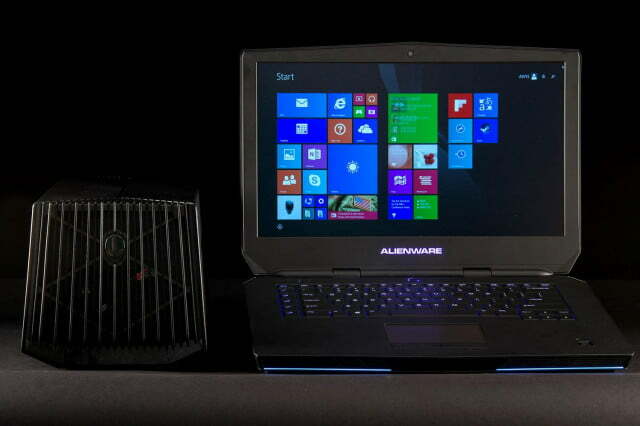 The Alienware 15 is not a portable system. 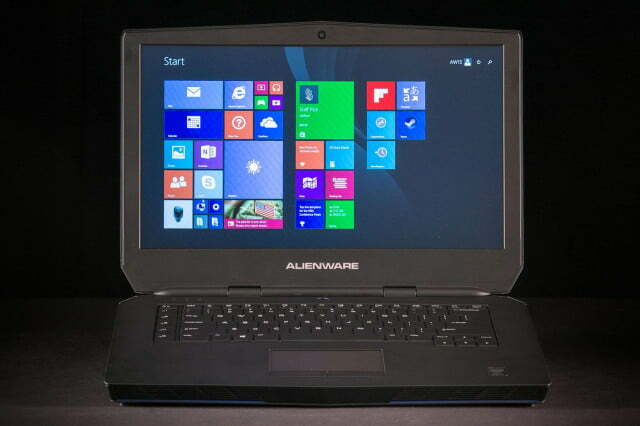 It weighs in at a hefty 7 pounds, making it one of the heaviest laptops we’ve seen in a while. Even other gaming laptops like the Acer Aspire V15 Nitro and the Digital Storm Triton only weigh around five pounds, and the Acer has a 4K display. The only system that’s heavier is the Asus G751, but that has an upgrade to a quad-core Intel Core i7, a GTX 980M, and 24GB of RAM. There’s another weird problem with portability: while the main footprint of the machine would fit fine in a laptop case, its thickness makes it unlikely to fit snugly into sleeve. Larger cases and spaces in backpacks or briefcases shouldn’t be an issue, but you won’t easily find a standard padded laptop sleeve that fits nicely. The Alienware is thirsty for power. At idle, the system pulls between 30 and 35 watts constantly, much higher than the Digital Storm Triton, but slightly less than the Asus G751 series we tested. With the CPU taxed via 7-Zip’s benchmarking utility, the Alienware’s power draw doubles to around 60 watts. With the GPU engaged and everything chugging away, the wattage goes up again, this time substantially, settling just under 100 watts. That’s actually not much at the top end, especially when you compare it to the 183 watts pulled by the Asus G751, or even the 116 the Triton needed. Even if it’s competitive with other gaming laptops, it’s still pretty hefty, and explains the humongous 92-watt hour battery Dell had to pack in to keep the system fueled up. The result is that it fares much better than other laptops with similarly sized batteries. While the Asus G751 only has about three hours of life on a single charge, the Alienware is capable of running the Peacekeeper browser test for almost six hours without refueling. That’s impressive for a gaming laptop. You won’t want to use this system on your lap. Even after just a few minutes of gaming, the temperature on the bottom of the laptop, and on the keyboard, broke 100 degrees Fahrenheit. The rest of the system did stay relatively cool. The flaws of the dual-core processor become evident when the benchmark tests kick both cores into gear. At idle, though, the fan is so quiet you’ll likely never notice it’s on. That’s good news too, because when it does get going, you can definitely hear it. The fans whir away at 48 decibels. That’s 10dB louder than the Asus G751. The difference is night and day. The Alienware Graphics Amplifier is even noisier. As soon as you turn it on the fans on the GPU start spinning up, and they don’t stop until you shut the system down. Because the enclosure is small and has lots of venting, you can hear all of those great noises graphics cards make — the whirrs and buzzes and beeps — all too well. When it was warmed up and gaming, the combined noise of the Alienware 15 and the Graphics Amplifier came up to about 55dB, which is a lot closer to desktop gaming systems than most other laptops. 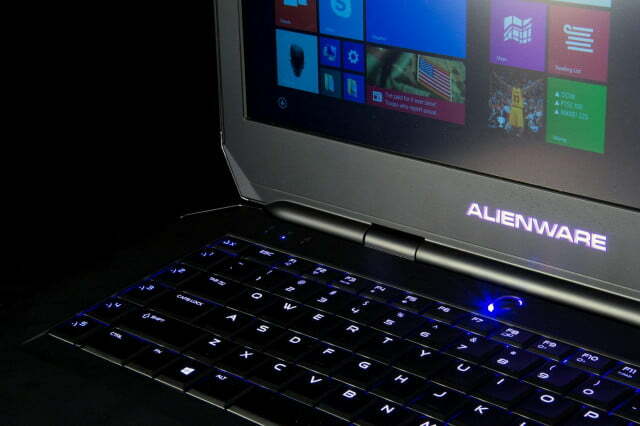 It’s no secret that computer manufacturers load extra software onto your machine before sending it your way, and the Alienware 15 is no exception. Some of the software they include, like Qualcomm’s Killer Network Manager or the AlienFX lighting controls, is useful for managing your laptop’s devices and connectivity. Some of the software is bloatware, and in this case, it actively gets in the way of your computing and gaming. One utility in particular, Dell’s SupportAssist software, causes a number of issues during regular operation. It occasionally causes notifications to pop up in the bottom right corner by the task bar, and whenever it does, the screen and audio go black for five or six seconds. If you’re in a full screen game, it will be minimized when the screen comes back on. That’s hugely frustrating. Like other Alienware computers, this laptop comes with a number of Alienware-specific utilities. The AlienFX application lets you control all the different lighting zones on and around your keyboard. AlienRespawn is a data backup and restore utility, but to enjoy full functionality out of it you need to upgrade to the premium version, and at that point you might as well buy third-party backup software. 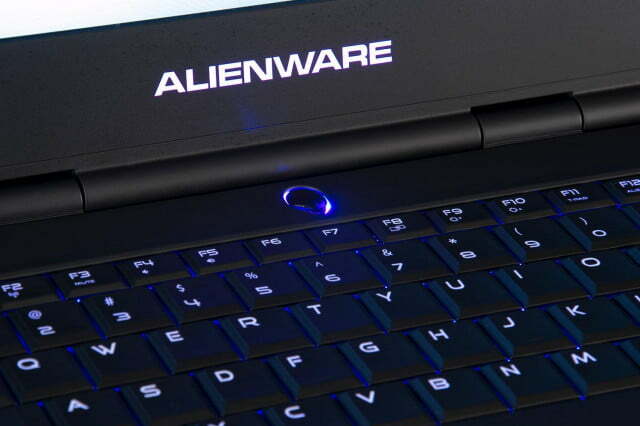 Each Alienware comes standard with a year of Alienware Basic Support. That means if something goes wrong, after a remote scan of the system to diagnose the problem, a technician from Alienware will make a house call to fix it. That’s pretty slick customer service, and it doesn’t cost you anything extra. Longer warranties are available if you’re willing to pay. No one games on a touchpad! This mouse is a classic go-to for its simplicity, comfortable ergonomics, and made-for-gaming response level. This massive gaming backpack has plenty of room for your thicker-than-average Alienware, plus a sleeve for transporting a console. Tune out the haters and get your game on with a 7.1 surround sound gaming headset, noise-cancelling boom mic, and in-line controls. Back up your data on the go with a 1TB external hard drive. It’s even equipped with USB 3.0 for fast transfer speeds, and it’s portable, no power source required. Which brings us to the processor. While there is bound to be some discussion about the merits of a third and fourth core, the effect in some games is clear, and will leave you wondering whether your GPU is living up to its potential, or whether you really needed to splurge for 16GB of memory. We found the dual-core to be a serious bottleneck in Civilization: Beyond Earth and Grand Theft Auto V.
Thankfully, there is another option. For just $100 more you can buy the exact same computer from Newegg, but with a quad-core Intel Core i7-4710HQ. That’s a hot deal, especially when you compare it to the $1,499 option on the Asus G751, which lacks a solid state drive. The Alienware 15 is also a few hundred dollars less than similarly powerful MSI gaming laptops. You might want to go with the dual-core Alienware 15 if you’re a frequent flier, though, as it contributes to our test rig’s stellar six hours of battery life. This is also one of the more affordable builds for the Alienware 15. 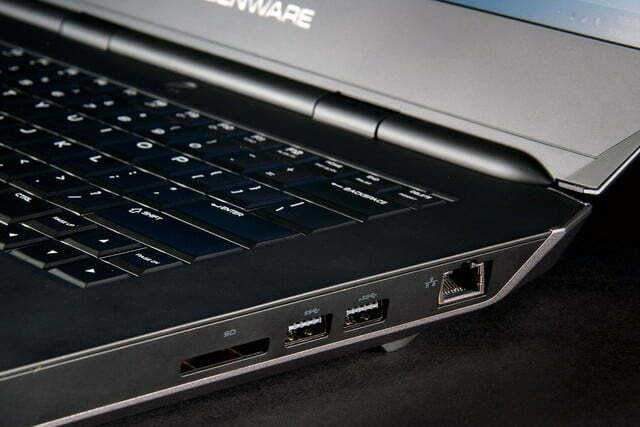 As for the Alienware Graphics Amplifier, it’s only worthwhile for a small subset of users. If you have an extra graphics card lying around, and you decided to splurge for an upgraded CPU, and you often find yourself gaming at your desk without going anywhere, it’s worth looking into. Even so, the price is steep. You’re looking at $199 for the Amplifier, and another $550 for a GTX 980. You could opt for a less expensive card, of course, but that will make the Amp’s performance gain slimmer. 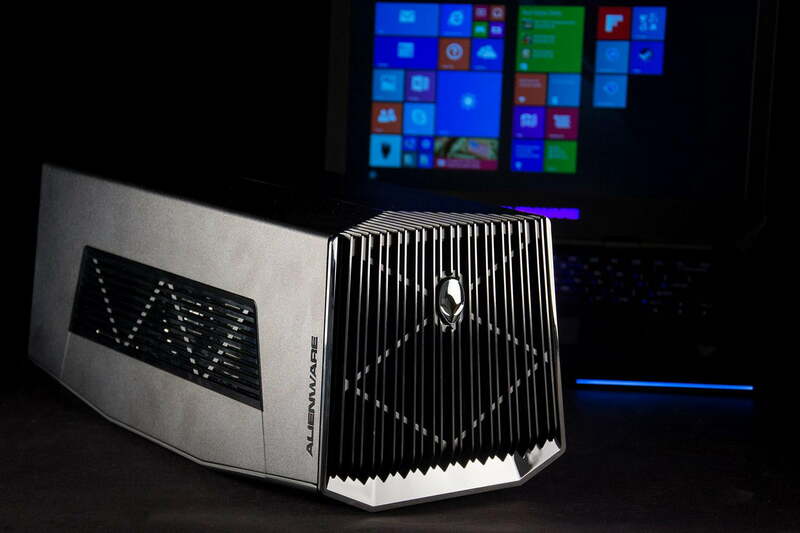 The money would be better spent upgrading the Alienware 15’s GTX 970M to a 980M.